How many cords for charging your various mobile devices have you accumulated over the years — five, 10, 20? Wouldn’t it be great if you didn’t need to keep track of all those specific cords for specific devices? Today, more and more devices come with wireless charging built in, and chargers are found in common household items like lamps, computer monitors, as well as public places like Starbucks and airport lounges. Wireless charging is convenient and easy to use, especially if the charging technology is built into your device or there’s a good case option for your device. Just place your supported device on a compatible wireless charging base. That’s it! Could you use wireless charging to charge your devices without cords? 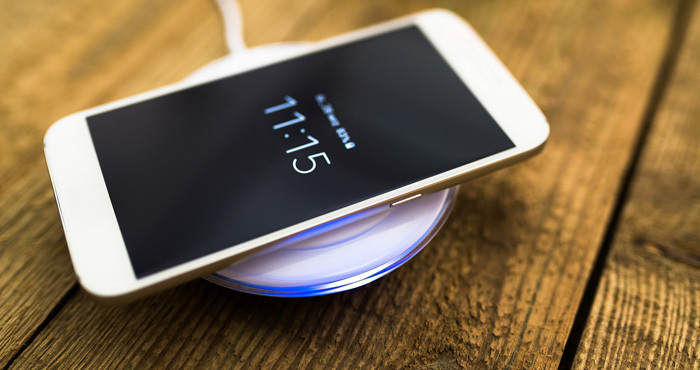 Wireless charging occurs through a magnetic field generated by the charger that surrounds both the charger and the device, enabling the transfer of power. You don’t need a physical connection between the device and its charger, but the two need to be very close — no more than 5 centimeters apart, including the thickness of the device case. In most cases, you can simply rest your phone on the charging pad. The main benefit of wireless charging is no more power cords. No more accidentally pulling the power cord out along with your phone or fumbling to disconnect your phone from the charger to take a call. There’s less wear and tear on your device from frequent plugging and unplugging. The process isn’t completely wireless, because you’ll still need to plug in the charging station. But you’ll only need one charging station for all your devices, and you may even be able to charge them all at the same time using just one charging base. However, wireless charging is generally slower than wired charging, though new specifications and standards will soon push speeds to rival those of wired charging. Picking up your phone stops the charging process, which can be problematic if your battery is low. And some phone cases, especially thick ones or those made of metal, may not work with wireless chargers. Mobile devices primarily use one standard: Qi (pronounced “chee”) by the Wireless Power Consortium (WPC). Qi is built into smartphones, smartwatches, Bluetooth speakers and charging stations in clocks, lamps, tables, computer monitors and cars at locations like coffee shops and airport lounges. To charge, you place your phone on a marked charging spot. A Fast Charge version of Qi is available in select mobile devices, including the Samsung Galaxy S8 (up to 9 watts) and Apple iPhone X (up to 7.5 watts). The chargers can support charging speeds of up to 15 watts, though there are no phones capable of these speeds yet. The charger and device both have to be Fast Charge compatible. Is your device wireless-charging ready? Qi is the most widely used standard, with more than 2,200 Qi-ready devices including smartphones, smartwatches, Bluetooth speakers, and other mobile devices from manufacturers like Apple, Nokia, HTC, Samsung, Motorola, LG, Google, Panasonic, Philips and Sony. All Qi-compliant devices bear the Qi logo and will work with any Qi-compliant charger, regardless of who made the charger. 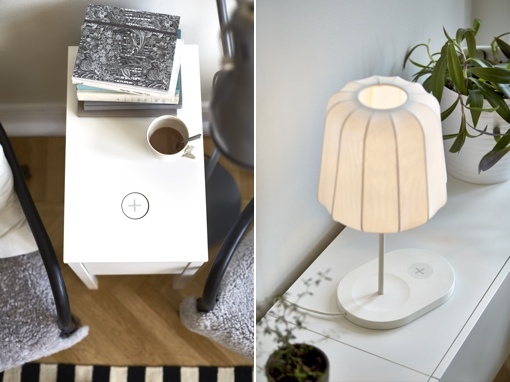 You’ll find Qi chargers in Ikea furniture and Toyota, Lexus, Cadillac and Chevy vehicles, to name a few places. If you're looking for a standard-speed wireless charger (5 watts), you can pick up the Andker PowerPort Wireless Charging 5 Pad or PowerPort Wireless 5 Stand for $20 on Anker.com (check price on Amazon). For a fast charge pad (15 watts), try the Samsung FastCharge Wireless Charging Convertible ($65 on Samsung.com, check price on Amazon). Thanks for this article. I have been using two different wireless chargers - one in the house, and one in the car. The big drawback for me is that my particular phone case, which I quite like, is too thick to allow the charging connection. I need to wiggle my phone out of its case each time I want wireless charging. It’s frankly easier to just plug in the charger. Some phone cases are thin and do support charging while the phone is in the case, but none are the style I like (I like a flip-open cover). So, wireless charging could be more trouble than expected, depending on the case used.